In these examples, we used this sesame peanut sauce recipe. It’s our favorite to use with tofu! Transfer tofu to parchment lined baking sheet. Bake at 400°F for 35-40 minutes, flipping halfway through. Marinade can be reserved and brushed onto tofu during the baking process for extra flavor. 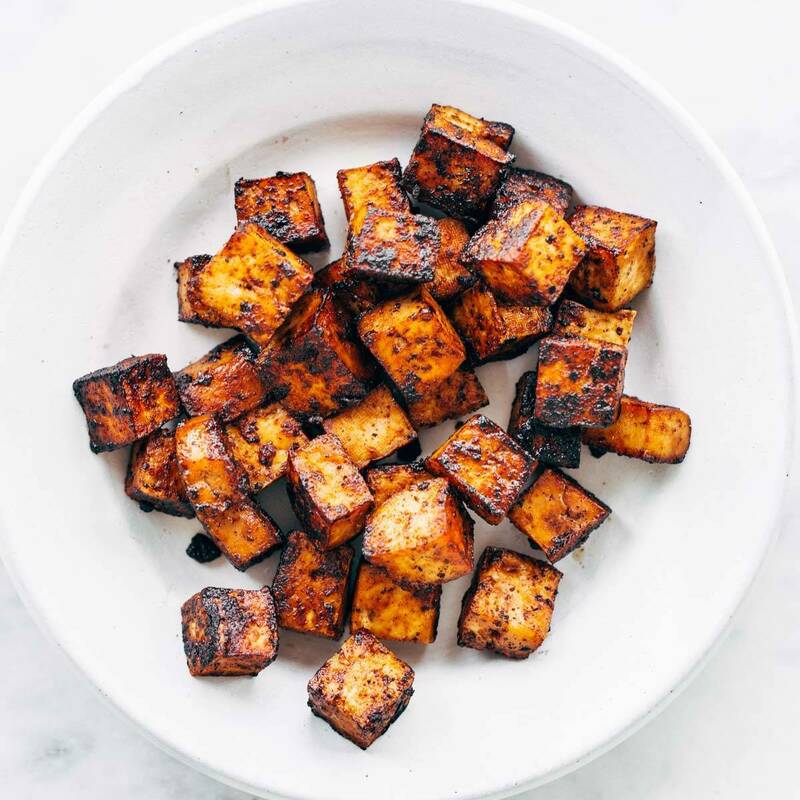 Baked Tofu can be served as a main dish or added to noodle bowls, rice bowls, or salads. 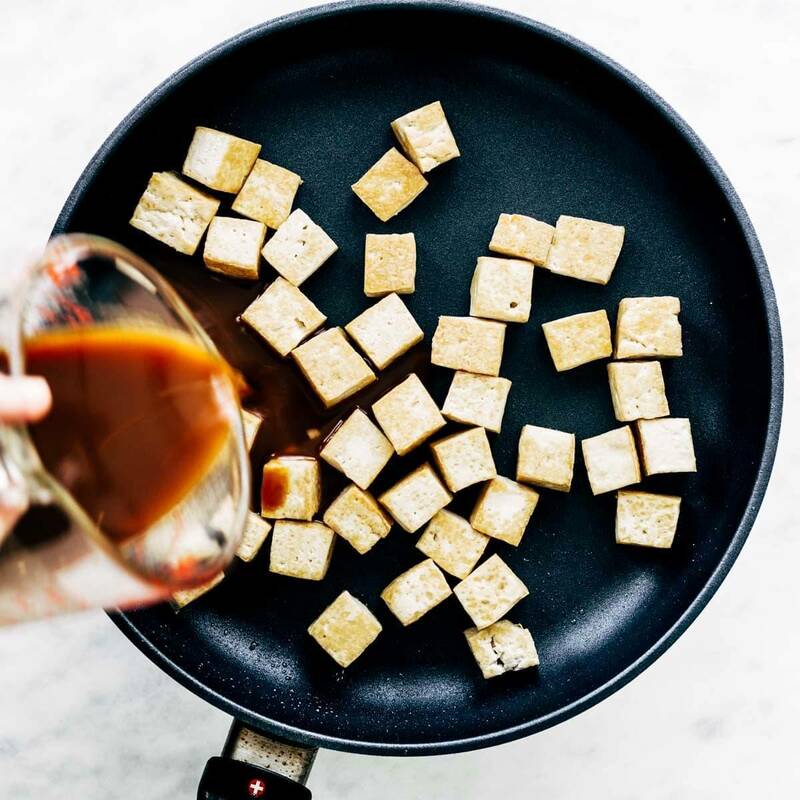 Sauteed tofu is cooked with a small amount of oil and a bit of sauce to create a delightfully crispy exterior. 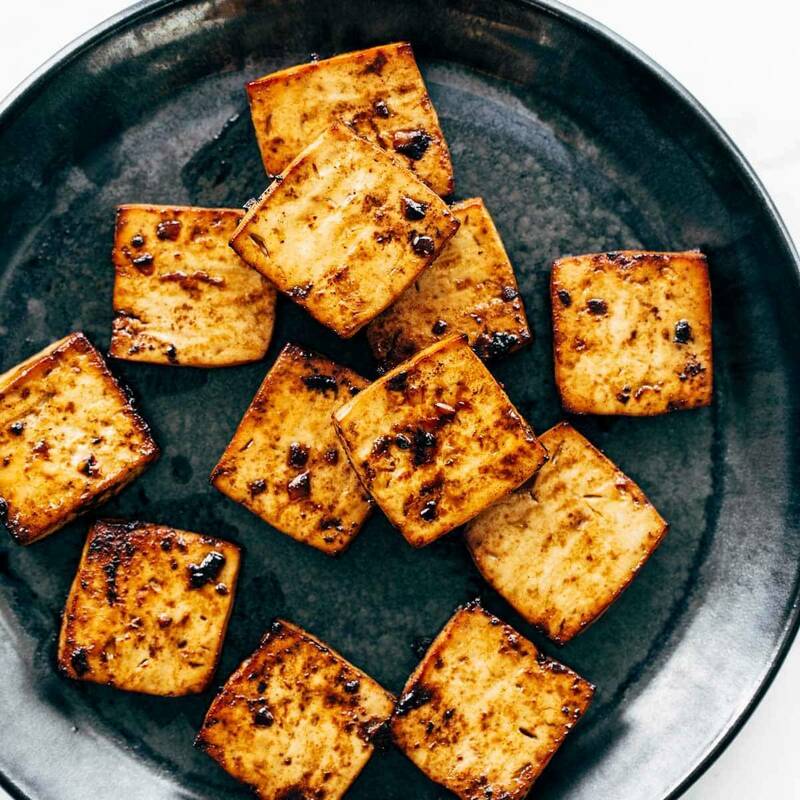 Press extra firm tofu for at least 30 minutes and cut into cubes. Add a small amount of oil to a non-stick skillet and heat over medium high heat. Add tofu to pan and brown on each side for about 1-2 minutes for a total of about 15 minutes. Once all sides of tofu are lightly golden brown, add about 1/4 cup of sauce. 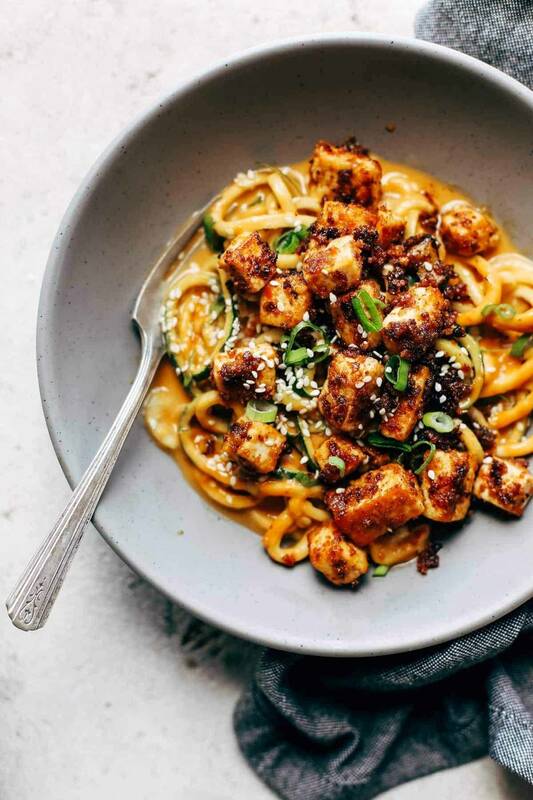 Cook tofu, stirring frequently until sauce has been absorbed into tofu and caramelized around the edges creating a crispy exterior. Add sautéed tofu to salads, stir fry, noodle bowls, or soup. 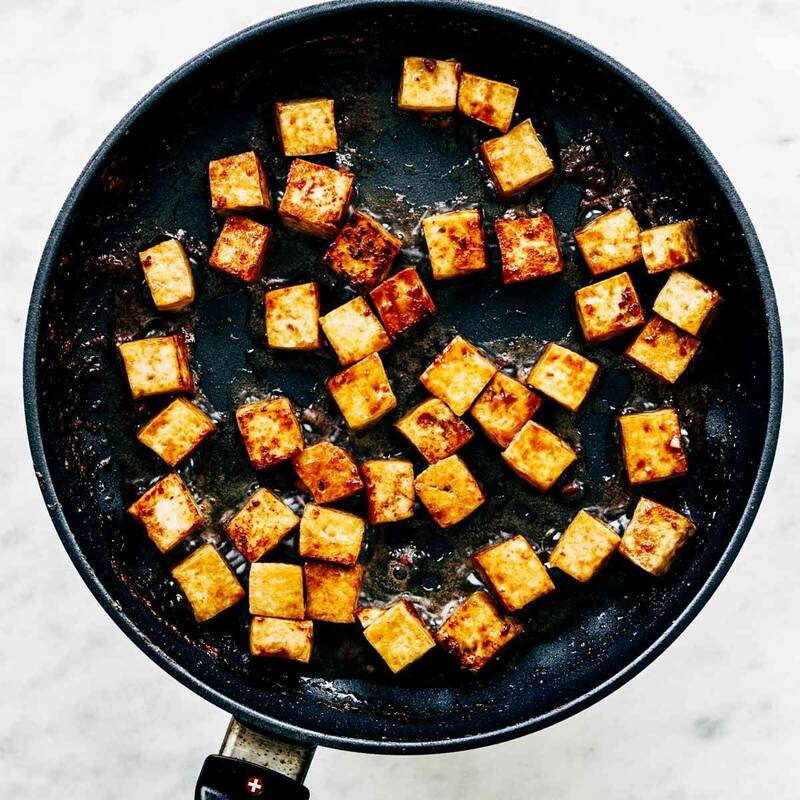 Frying tofu is a very simple and quick way to cook tofu. 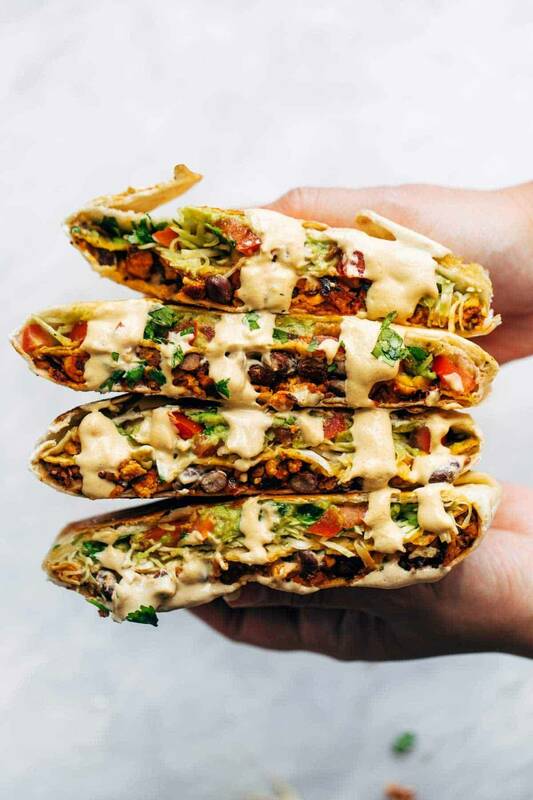 It achieves a reeeally golden crunchy exterior that makes for a hearty plant-based meal. 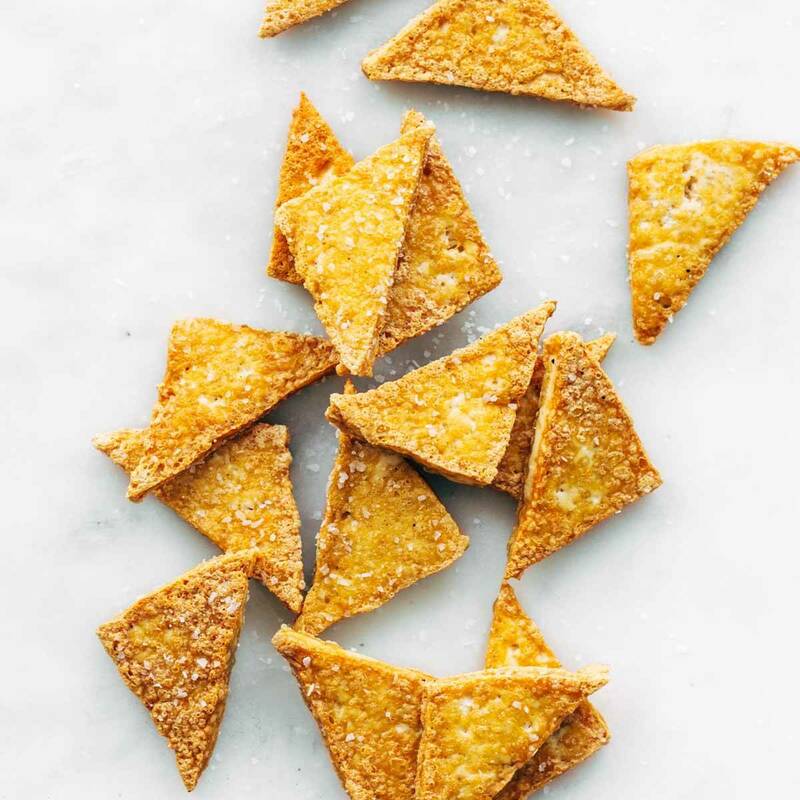 Press extra firm tofu for about 30 minutes and cut into triangles. Heat a few tablespoons of oil in a skillet over medium high heat. Add tofu to the pan in a single layer. Do not overcrowd the pan. Allow tofu to cook, undisturbed for about 4-5 minutes or until the underside is golden brown and crispy. Flip the tofu pieces and season the cooked side with salt. Allow the second side to cook for an additional 4 minutes or until the second side is golden brown and crispy. Remove from pan and drain on a paper towel. Season second side with salt. This crispy tofu can be be tossed with a sauce after cooking for extra flavor. We used triangles of tofu, but cubed or sliced tofu works well with this cooking method, too. 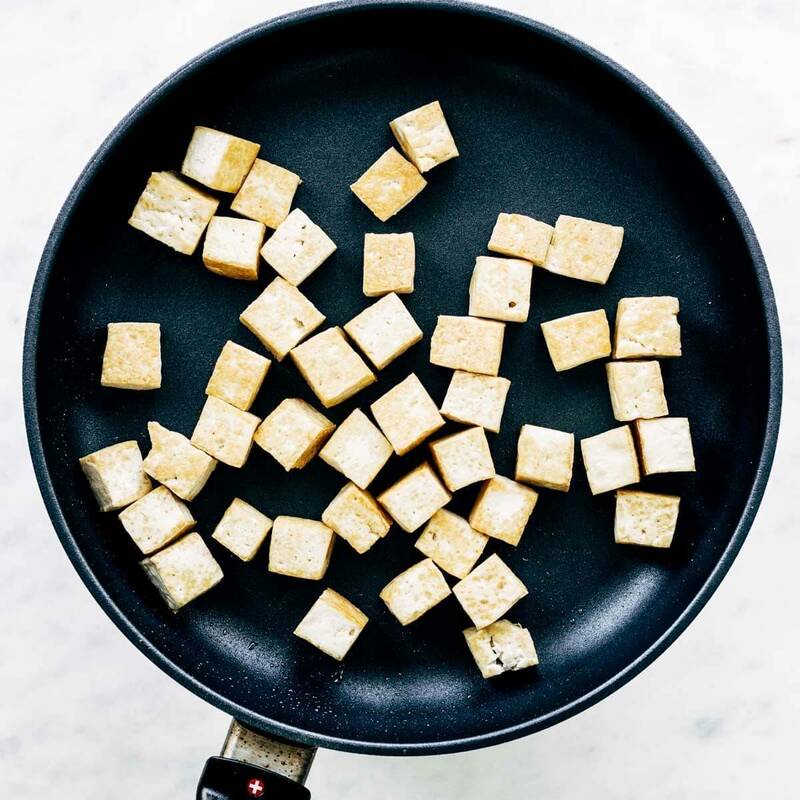 If cooking cubed tofu, flip onto all sides during the cooking process to ensure even crispiness. If desired you can add a sauce toward the end of the cooking process and flip tofu over to coat and allow sauce to brown at the edges. If planning to add sauce during cooking process, use slightly less oil while frying to avoid splattering and an overly oily sauce. 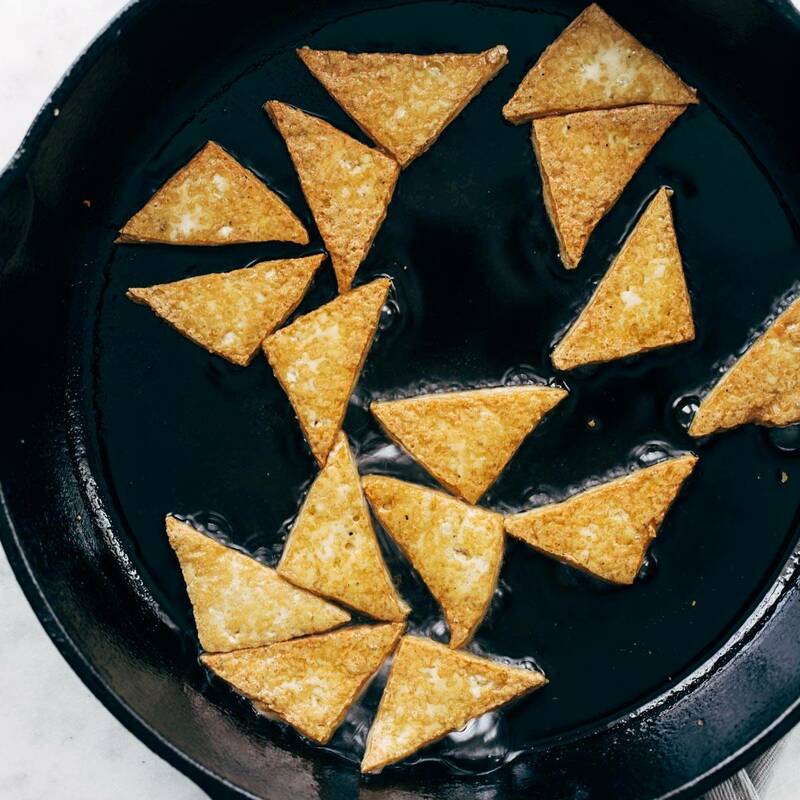 Scrambled tofu is similar to pan fried tofu, but instead of large pieces, the result is flavorful crispy bits of tofu that can be added to tacos, casseroles, bowls, and salads. Heat about 1 tablespoon of oil in a nonstick or cast iron skillet over medium high heat. Add pressed and sliced tofu to the pan. 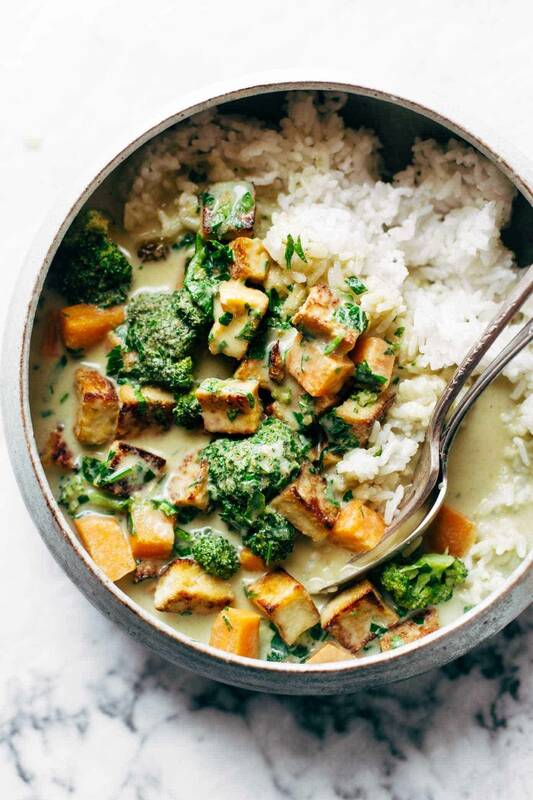 Use a wooden spoon or spatula to break or ‘scramble’ the tofu into small pieces. Once the tofu is scrambled, add some sauce or seasoning to the pan. Cook for about 3-4 minutes stirring or until all the tofu has been evenly coated in the seasoning or sauce and it has started to absorb into the tofu. Then allow tofu to cook, undisturbed for about 4 minutes. This allows the tofu to become crispy. Give the tofu another quick stir to redistribute the cooking surface, and allow to cook for an additional 3-4 minutes or until the tofu has achieved the desired crispiness. The longer you let the tofu cook undisturbed, the crispier the tofu will get. Technically, tofu does not need to be cooked. It is ready to eat straight out of the package. The most common tofu to eat raw is silken tofu. It’s often used in vegan desserts to achieve a creamy texture. 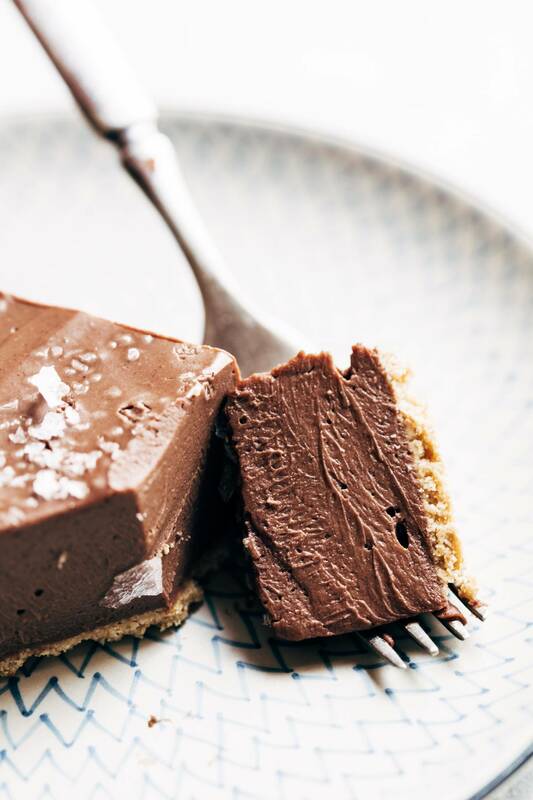 For example, this mind-blowing vegan chocolate pie. Firm tofu, while able to eat raw, is best used in various cooking applications. Tofu contains a large amount of water when it comes out of the package. 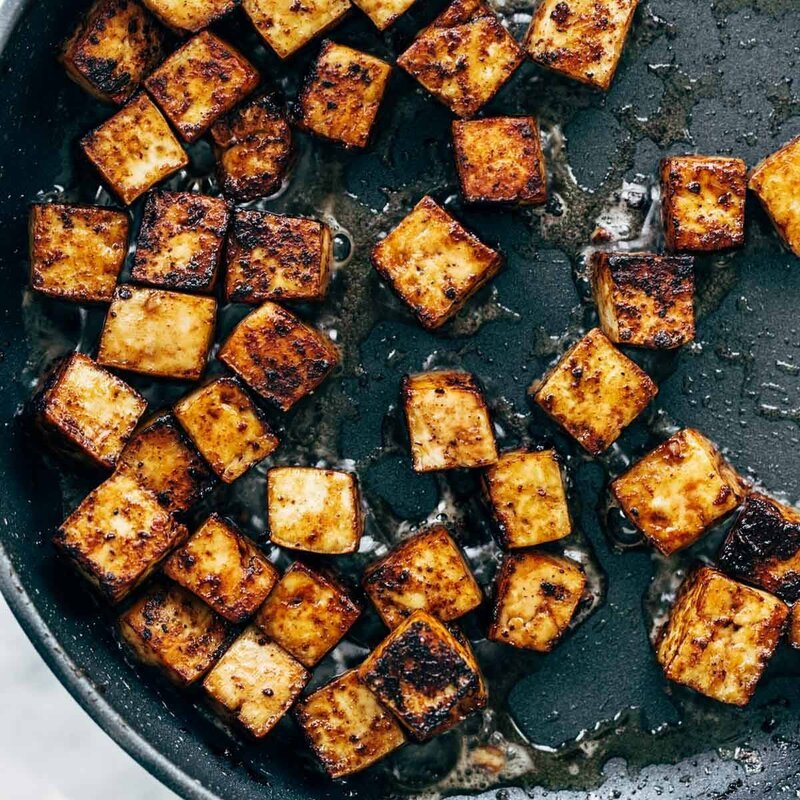 In order to bake, fry, or scramble tofu, it’s best to press out as much water as possible before cooking. The longer you press your tofu, the firmer the texture will be and the easier it will be to achieve a nice crispy texture. 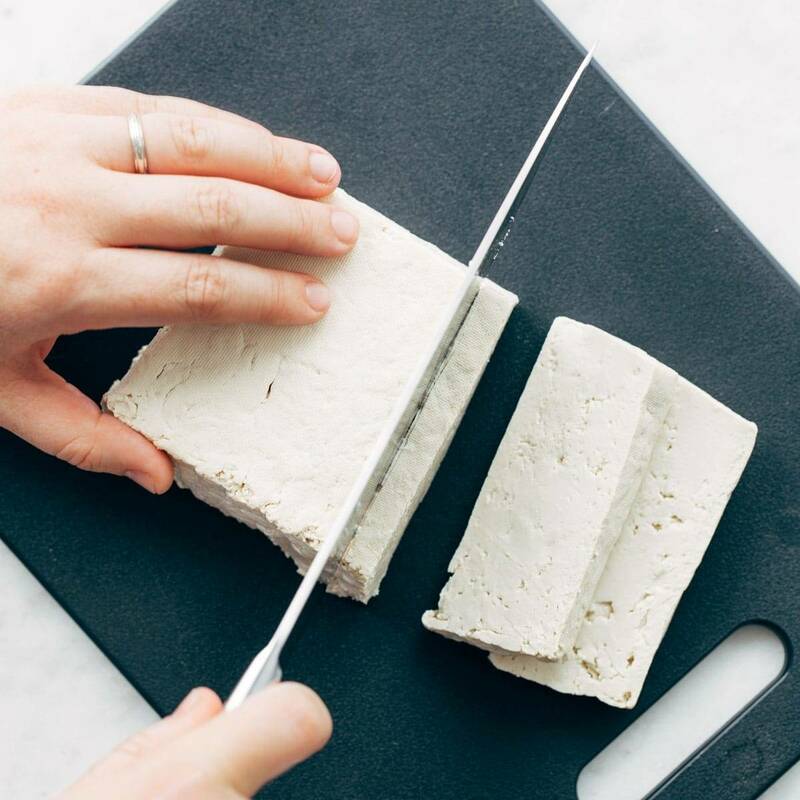 If you make a lot of tofu, you may want to purchase a tofu press designed specifically for pressing out the water from tofu. 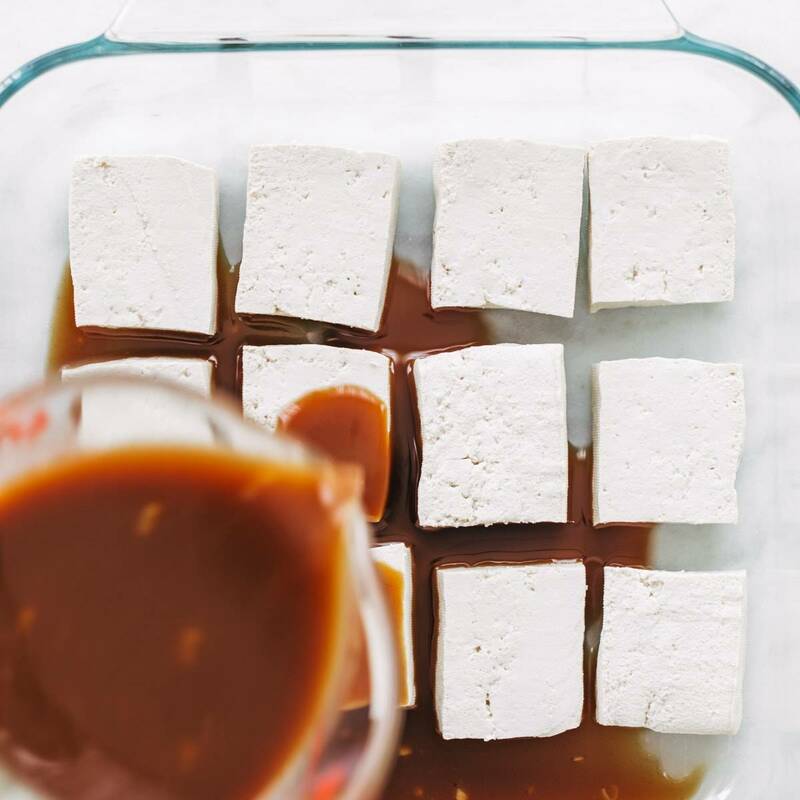 If you do not have a tofu press, you can use standard kitchen items to help with this process. 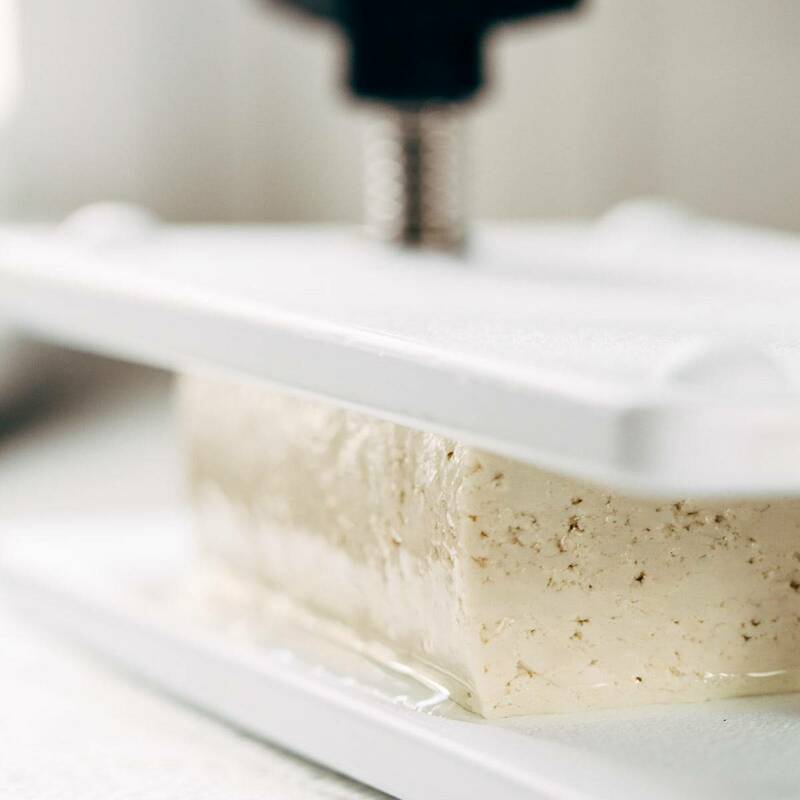 This pressing method works best on firm or extra firm tofu. It is not recommended to press silken or soft tofu. How Do You Cut Tofu? Tofu can be cut in a variety of shapes and sizes. 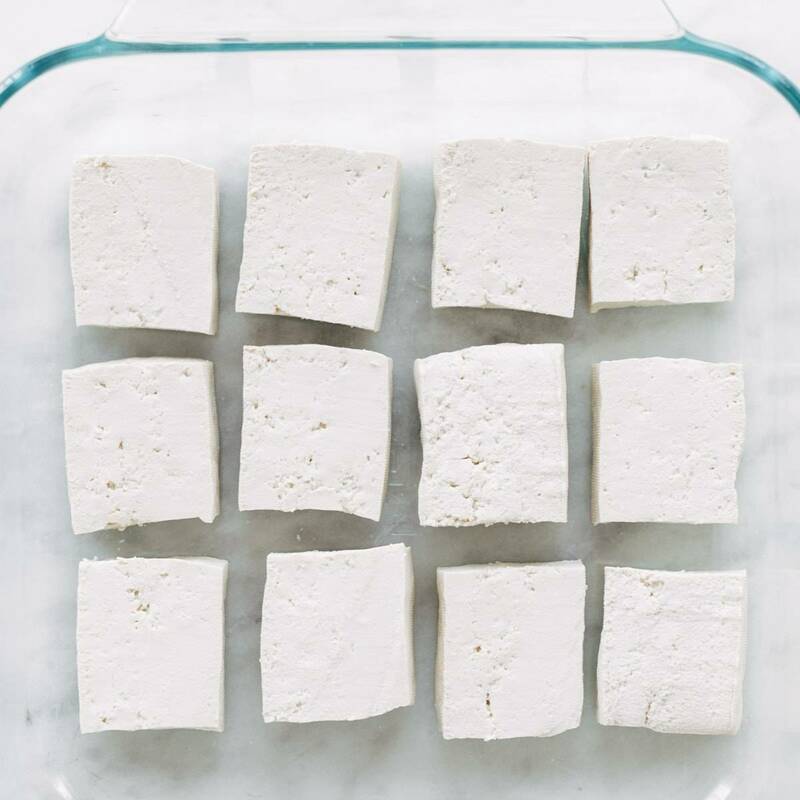 Once you have pressed your tofu, most shapes start by cutting the block of tofu into 1/4 inch – 1/2 inch thick slices. 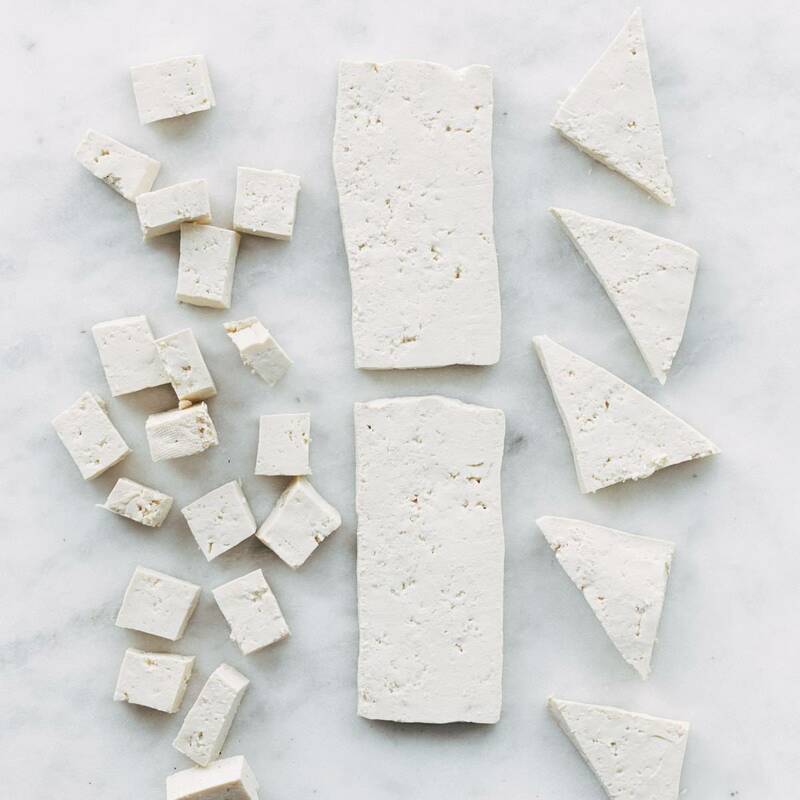 From there, you can cut the tofu into small cubes, triangles, or leave them as slices for more of a tofu steak. 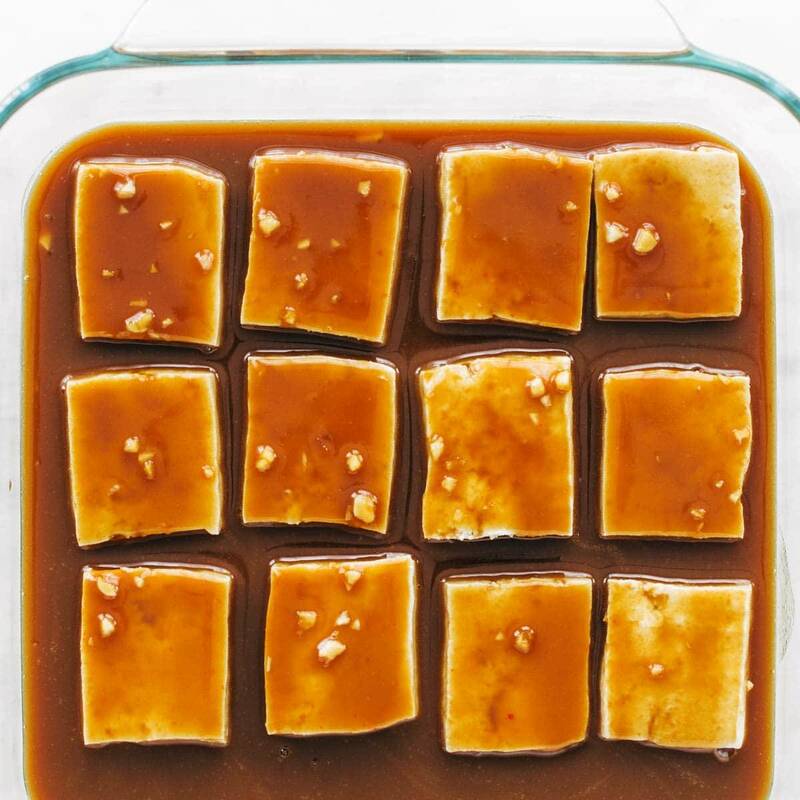 Cubes of tofu are very versatile and can pretty much be used in most cooking applications. Tofu comes in a range of firmness from silken to extra firm. 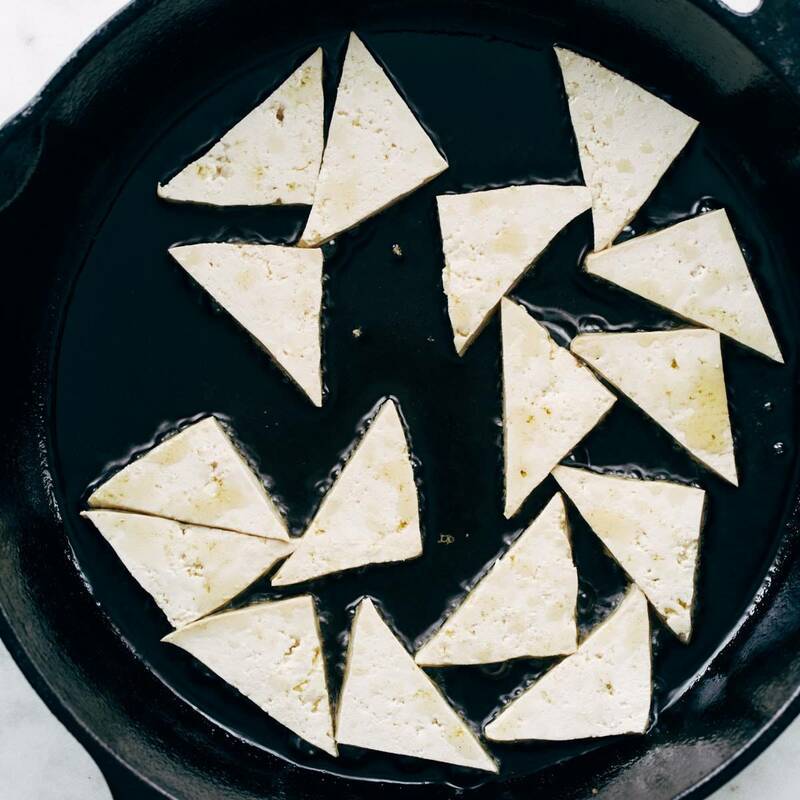 Extra firm tofu has the tightest curds and can stand up to hearty cooking methods, such as pan frying and baking. Firm tofu is often used in traditional Asian soups such as hot and sour soup and miso soup. Silken Tofu is perfect for making creamy, vegan desserts or any in any recipe that requires the tofu to be blended. Appreciate your recipes very much. Since you have been so thorough with information on tofu, wanted to tell you about – “boiling tofu”. Imagine! It is a particularly worthy cooking method since it doesn’t involve pressing, and you go straight from the freezer to the boiling pot and boil for 15 minutes. Do a google search. And thanks again. so easy I have no trouble. Tofu in Sesame Peanut Sauce looks yum. I haven’t tried this before but will definitely prepare. I have tried this amazing chinese dish KUNG PAO TOFU, tofus tossed in Kung Fao salt. You can try those. Here, browse the sumptuous menu of Friends of Pho. Let me begin by saying I LOVE your tofu recipes (and all you plant based recipes). However, I can never ever get my tofu to cook the way yours seems to in the pan. Ever time my tofu majorly sticks to the non stick pan. Even with plenty of oil. Any suggestions? Pan you use? Glad to hear it, Emma! about top most expensive things on earth.